Animation studio AIC announced at AnimeJapan 2019 that they are moving forward on a project to reboot the science fiction robot anime Megazone 23. The announcement follows successful crowdfunding campaigns launched in 2017 and in 2018 to finance two separate projects related to Megazone 23. Megazone 23 was first released on VHS and VHD in 1985 to commercial success. According to market data compiled by Oricon, first week sales of the anime reached 7,590 copies, placing it first in that week's sales rankings. It was the highest first week sales figure for a work of anime at the time. Megazone 23 also went on to sell more than 26,000 copies, the highest sales number ever for an OVA release at its time. The success of Megazone 23 led to a boom of "mecha and bishoujo" anime titles produced during that time period. But whereas the original Megazone 23 release was produced by animation studios Artland and Artmic, AIC became involved in the series only beginning with the production of Megazone 23 Part II, released in 1986. By the time Megazone 23 III was released in 1989, AIC had become the primary animation studio for the series. 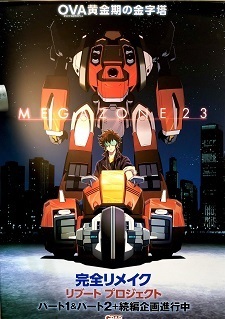 According to promotional materials displayed at AnimeJapan 2019, AIC plans to reboot the first two parts of the series into a TV anime titled Megazone 23 Sin. In addition, a sequel work to be titled Megazone 23 Xi, which diverges from the original third part of the series, is also being planned. A promotional video of the reboot project was previewed at the AIC booth featuring Moe Toyota as the voice of new main character Sakura alongside series veteran Kouichi Yamadera. Oh, I’m really curious to see how this will do! Remakes, especially as of late is not too uncommon, but it’s very pleasing another very influential piece getting such a treatment! It’s not very often we get two Seasons announced early first thing, I hope this just goes to show that the Studios behind this remake project are well prepared and confident about this. Visual looks very stylish, hopefully it won't be a case of style over substance though.Wonder how they'll go about modernizing it considering the original OVAs are from the 80s. >AIC plans to reboot the first two parts. >A sequel work to be titled Megazone 23 Xi and which diverges from the original third part of the series is also being planned. Good that they're ignoring the original Part III. Cool, a remake and then a sequel. Looks like fun. I may have seen the original back in the day but it's all a blur, I'll check it out again. One of the most unexpected announcements ive seen. Oh god a reboot of megazone. This is exciting! Damn son, Its 2019. Miracles do happen. What next remake of Bubblegum Crisis?? I don't know about this one. I like 80's anime because it has a certain feel to it with the art style, voice acting and music. I don't think a re-make is at all necessary, the original did the job just fine. I guess Japan is going the Hollywood route and just digging up 80's movies and re-making them since they are running out of ideas.